Ryan Edwards and The Biddys - Kapiti Playhouse Inc.
A concert featuring local musician Ryan Edwards and comedy act The Biddys. Tickets available from Lee Norris 021 599 180 or email leebythesea36 [at] hotmail [dot] com. Ryan Edwards is a singer-songwriter New Zealanders are only just getting to know. Ryan grew up in Wellington, pursuing a career in radio broadcasting before moving to London to further his musical pursuits. 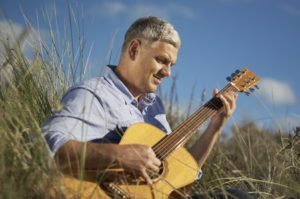 With an earthy voice and thoughtful lyrics, he has been likened to US Folk/Soul singer Ray Lamontagne, with others claiming his voice and songwriting is on a par with that of Tracy Chapman. He is currently living in Waikanae Beach. The Biddys are a fabulously colourful blarney-fied comedy and music trio! A variety act who’re full of Irish bull and blarney with some shenanigans thrown in!